ST. JOSEPH, MO.- The St. Joseph Mustangs annual “We Love St. Joe” night raised thousands of dollars for the Noyes Home for Children, a safe haven for children in crisis. 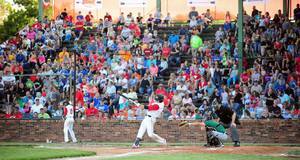 Originally, the Mustangs scheduled Tuesday, June 19th to offer free General Admission to the public, with any size donation made to the Noyes Home for Children at the ticket booth. Due to weather during the day on Tuesday, the Mustangs decided to extend the offer to the following game, on Wednesday, June 20th. The Noyes Home has been serving the St. Joseph area for over 120 years as a safe haven for families and children. The community of St. Joseph responded by raising nearly $2,000 for the Noyes Home, all through donations made at the Mustangs games on June 19th and June 20th.